Doctor Who begins the final season for current Doctor Peter Capaldi and current showrunner Steven Moffat with the introduction of a new companion and a mysterious creature to be dealt with. New companion episodes are always interesting on a conceptual level. In each case it provides a jumping on point for new fans as there is suddenly an uninitiated character who isn’t aware of everything the show is about and can ask all of those questions. The real trick is to present this in such a way that doesn’t feel like a retread for long term fans of the show. Enter Bill Potts (Pearl Mackie) who immediately echoes Rose in that she is from humble beginnings. Rather than being a student at the University the Doctor now works at -more on that later- she works in the cafeteria but sneaks into the Doctor’s lectures. Right away we learn that she has a thirst for knowledge and an inquisitive nature along with a desire to make herself better. Clearly going to University is a barrier that she couldn’t overcome but she deals with it in the best way she can. The Doctor takes notice of her because of her approach to learning. He mentions that she smiles when she doesn’t understand something rather than the standard frown adopted by most students. It’s a really small thing but it’s noteworthy and it’s something that stands out to the Doctor. It makes sense that this would encourage him to consider her as a companion as we have seen him recognise small and unconventional character traits before. The real purpose of the episode is to prove her worthy of our attention as vieweres. I would say that the episode mostly does a good job of this. Pearl Mackie does a really good job giving Bill lots of personality and the right amount of smarts without coming across as obnoxious. She is clearly a challenging person to be around but not to the point that she will be irritating to watch; at least not so far. It would be remiss of me not to mention the fact that she happens to be a lesbian -or at least not straight- despite the fact that it really isn’t that big of a deal. It does factor into the story but in the same way that a male character having a crush on a female character would. No extra fanfare is given to it and it comes across as something very natural. It certainly isn’t something that is considered remarkable to the Doctor and the episode just lets it happen without it being a big deal. As far as I’m concerned this is as it should be and there’s definitely more to the Bill character than her sexuality. As companions go we are given the usual markers that will show her as a suitable match for the Doctor. She is able to understand what is wrong with the reflection in the puddle after being prodded and her reaction to the size of the interior of the TARDIS may be more delayed than we are used to but the way she goes about rationalising it feels fairly unique. The companion reaction to the TARDIS is something we’ve seen a lot of so the fact that it can still feel different is remarkable in itself. Bill is definitely a character who needs to have something lift her out of the life that she leads. She isn’t unhappy at all but there’s a sense that she is unfulfilled and there is potential that she is unable to rise to. This makes her ideal to travel with the Doctor and there is already a sense that their relationship will be a different one to what we have previously seen. As the episode begins the Doctor isn’t even looking for a companion but Bill makes a good case for him reconsidering his positions. The Doctor as presented here is interesting as his outlook has changed given recent events. It is established that he has put down roots in Bristol as a University Professor which is completely unusual for him since he has always been characterised as a wanderer. Right away this tells us that the Doctor has some issues that need to be resolved and the way his office is decorated suggests that he is struggling to put his past behind him. Peter Capaldi is still great to watch as this character. He has definitely found what his version of the Doctor is supposed to be and his eccentricities are always a delight. He is able to juggle the old soul with the childish enthusiasm perfectly and has ample opportunities to show that in this episode. The pictures on his desk really piqued my interest. He has a photograph of River Song and the reasons for that will be obvious to those who have been following the series. She is someone who he was close to and eventually lost so it’s a big regret that he carries with him. The other photograph is of his Granddaughter/first companion Susan Foreman. Bringing up this character is interesting for a number of reasons. To the best of my knowledge it has never been confirmed if she was actually his Granddaughter or not. If she was then that would mean that she is a Timelord which creates lots of possibilities. The most obvious being that she could regenerate which means that she could return in another guise later this season. I wouldn’t rule out Bill being a regenerated version of Susan at this point but I hope that isn’t the case. The fact that her picture is on his desk with River Song’s only adds to that potential since River also had that abilities. You can label this under crackpot theories but we’ll see if I happen to be correct at some point. Another interesting thing about the Doctor in this episode is that he has been there for decades though the main reason for doing this is to protect a vault that holds something mysterious. The only clue we’re given is that inside is something the Doctor doesn’t want to be curious about. It’s not a significant part of the episode but it is teased as a mystery to carry us through the season. I just hope it isn’t something we are reminded about every week without any actual development. I also find it intriguing that the Doctor has been sitting in one place for so long while all of his other incarnations come and go through the years in various places. 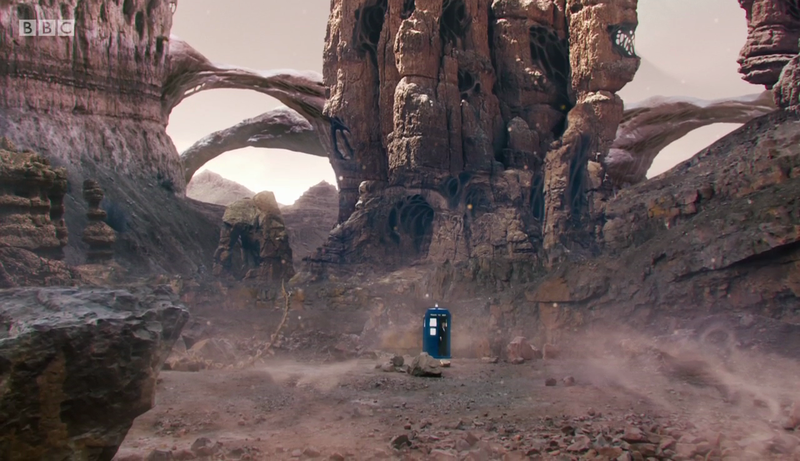 It probably isn’t something that will be brought up but it’s almost comedic to think that a version of the Doctor as well as the TARDIS had been there the whole time completely unnoticed. It did seem like he was keeping a low profile and it likely won’t go anywhere but it did amuse me. 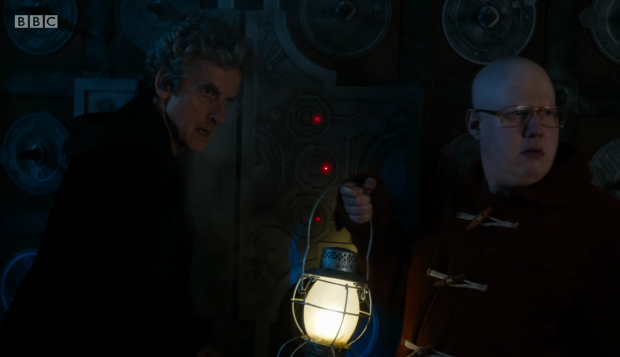 Nardole (Matt Lucas) is still around and doesn’t really have much to do here but bounces off Capaldi really well. If he is to be a full time companion the dynamic between the three characters is already very watchable. It’s always good to have a different perspective outside of the Doctor and the Companion so Nardole should be able to provide this in a way that is watchable. This episode had a fairly solid antagonist. Of course you’ll have to pardon the pun as she was mostly liquid. She/it wasn’t all that villainous which was a shame but it was appropriately creepy throughout. One of Moffat’s strengths has always been taking something innocuous and making it terrifying which he definitely achieves with the puddle. It’s something we see every day and dismiss so his suggestion that it could be dangerous is really effective. The fact that it can easily follow them through time and space works really well too. I found that there was an air of tragedy to the creature as it didn’t seem to have any malevolent intentions. The Doctor points out that it’s not evil but it is hungry so that suggests that there is something instinctual going on. Combine that with the fact that it begins as a potential love interest for Bill and the tragic aspect suddenly becomes fairly definitive. It was referred to as Heather (Stephanie Hyam) which helps to humanise it and as a vehicle to show how compassionate Bill can be it works really well. The fact that it shows her the wonders of the universe and appears to let her go was intriguing as well. The tear in Bill’s eye suggests that it isn’t quite over yet but it could also be an overwhelming display of emotion. As good as the hopping between locations to test the range of the threat was I found the inclusion of the Daleks to be completely unnecessary. 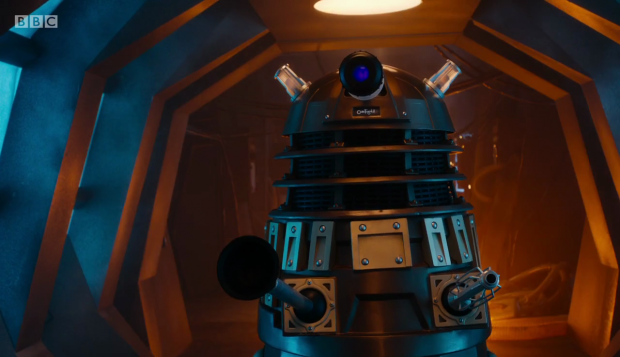 Fair enough if the Doctor wanted to test this new threat against the toughest thing he knows but this isn’t something he makes a habit of and it felt really jarring that he would just take someone new into the middle of a Dalek “skirmish” as he puts it. “Heather” is able to take a shot from a Dalek without flinching which is supposed to establish how much of a threat she/it is but there were other ways to do this. Once the threat had been dealt with we get to the part of the episode where the Doctor decides to bring his new companion on his travels. It is established that he has sworn off new companions but Bill is different and the episode does a good enough job of showing that. I like that he is unwilling after she has essentially proven herself and wants to erase her memory. It’s interesting that Heather offered Bill what the Doctor can offer her but he warns her off it even though from her perspective the offers are identical. We could be set to explore the ground of travelling with the Doctor being dangerous again. This creates a really powerful moment when she asks him how he would feel if someone did that to her. 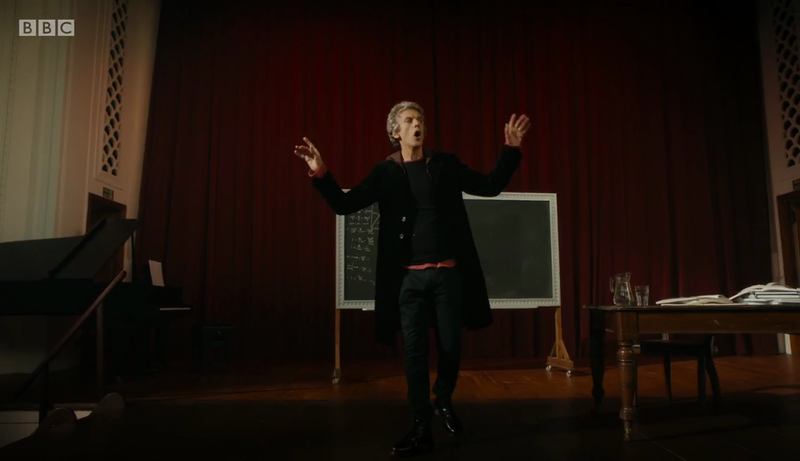 Clara’s theme is echoed in the soundtrack reminding us that he did this to himself at the end of last season. Even though he doesn’t remember it the sense of loss is still raw and Bill inadvertently latches onto a really touchy subject for him. It’s enough to make him reconsider and suddenly we have adventures in time and space again. It’s as good a setup as any and I’m interested to see where it goes. Despite the good points the episode was a really slow burn but not always in a good way. Spending time developing Bill and reintroducing the core concepts was all well and good but there were long stretches of the episode where nothing interesting was happening. So much of this could have been tightened up fairly easily but as it sits the experience is a bizarre mix of compelling and dull. A solid opening to the season with an impressive companion introduction. Bill is an interesting character who will definitely challenge the Doctor in very different ways and the beginnings of the dynamic between the Doctor, Bill and Nardole can be seen here. She proves herself to be a good fit as she is curious in a way that the Doctor responds to while also having plenty to learn. The introduction to the Doctor in this episode is interesting as well with him staying in one place for decades. It’s clear he is struggling with loss as shown by the pictures on his desk but there is also the secondary aim of defending the vault. This will definitely be an enduring mystery and the episode doesn’t make much of it but it’s clear that it will be dealt with a lot. The antagonist wasn’t that threatening but was appropriately creepy. I liked the way it followed the TARDIS through time and space effortlessly and the personal connection to Bill added a tragic air to it. It’s also good to see it specifically mentioned that it isn’t evil and is acting on an instinctual level. A random trip to use the Daleks to distract it could have been done without but other than that it was a creepy enough villain. Having this encounter leading to the Doctor being challenged on his plan to erase Bill’s memory was interesting as well since it calls back to Clara and the fact that the Doctor doesn’t remember her. I look forward to seeing how this dynamic develops. The episode itself was a fairly slow burn but not always in a good way. Long stretches of the episode went by with nothing interesting happening so the episode was a weird combination of compelling and dull.